Nearest misses: Capote, Tropical Malady, Last Days, Murderball, and Wolf Creek. I haven't posted mine yet, but though I haven't seen The Beat that my Heart Skipped or Palindromes, we matched 7 for 10. Quite the awesome list! Too bad "Tropical Malady" and "King Kong" didn't make the cut. 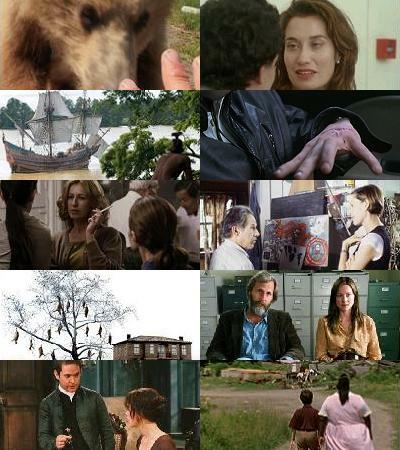 Considering the year we've had, I guess I should take it as a blessing that we matched on two whole films, GRIZZLY and PREJUDICE. Almost three, because SQUID/WHALE was close to my top ten. (And I, ashamedly, admit that I haven't yet seen JUNEBUG, PALINDROMES, or WEEPING MEADOW.) So that's not too bad, is it? And I liked BEAT THAT MY HEART SKIPPED, so wow...that's like 7 we might possibly agree on! Now I feel better. @Javier: King Kong probably would have been in that immediate runner-up category were it not for the second viewing. But I still think it's a mighty good moviecertainly among the best with even a hope of a Best Picture nomination. @Nat: That tenth picture is from Trilogy: The Weeping Meadow. A disgraced couple return home after long years away and find their family's entire flock of sheep gutted and hanging from a tree. @Gabriel: I have strong hunches that you wouldn't like Palindromes or The Weeping Meadow at all, though I'm quite hopeful about Junebug. Give it the Southern Boy test and check back in! Here I thought I did pretty well keeping up on all the must-see films last year, yet I haven't seen seven of the films from your list. Of the three I have seen, one made my top ten list (Grizzly Man) and one nearly made it (P&P). Ah, that "A" for The New World makes me so happy. I'm glad it lived up to your expectations, Nick. Must see Grizzly Man asap. Oh, do yourself a favor and skip Casanova; it's a train wreck. What has happened to me? Although I can recognize many of these movies by name, I haven't seen hardly ANY of them. In fact, I'm not even sure I saw 10 movies in all of 2005 (OK, I'm exaggerating, but I certainly haven't seen anything after August. August.). I'm now using this as my official rental list. Except for Junebug--not going to see that one agan. Can you imagine how much I liked seeing it a week before my due date?